NetEnt has released a new online slot game, Wild Worlds. 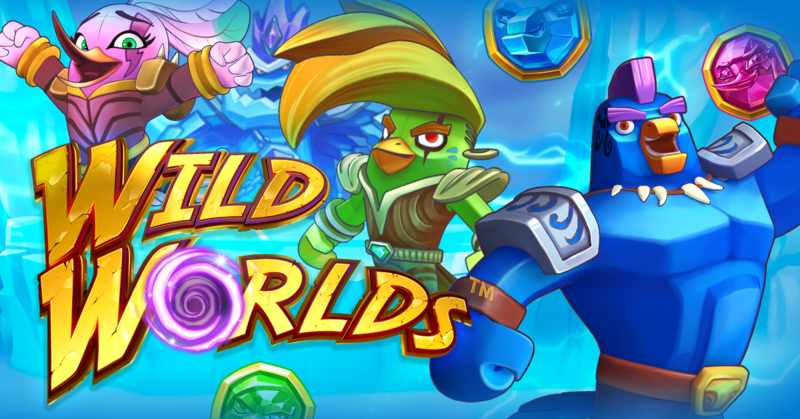 Wild Worlds uses a super hero type theme where during free spins you will be fighting monsters and bosses. The game is played on a grid of 5 by 5 symbols. When 3 or more of the same symbols appear horizontal or vertical, they count as a winning combination. The game uses collapsing symbols, much like Gonzo’s Quest. Any winning combination will be removed and new symbols fall on top to create a new winning possibility. Wild Worlds also comes with some added bonuses and free spins features. When you get a winning combination with hero symbols, all other hero symbols of that type that aren’t part of a winning combination become wild. When there is no winning combination this feature can appear at random. All symbols will be destroyed except for one color and scatter symbols. When you get 3 scatter symbols you will win the free spins feature. Spin the reel and see which of the three worlds you will enter. In the world you will fight captains and bosses. Each winning combination will attack the creatures and power up the heroes. These will also have a special attack after they have attacked three times. When you destroy a captain or a bosses weak spot you will activate the special wild symbols. Ice World – 8 free spins with heavy wilds that will stay on the reels when they are part of a winning combination for the next avalanche. Fire Lands – 8 free spins with 2 to 4 random wilds. Dark Forest – 8 free spins with random wilds and spreading wilds. When a wild symbol is used in a winning combination it will explode and new wild symbols will now appear adjacent to the spot it was previously. If you are able to defeat all captains and the boss you will retrigger 8 new free spins and the fight will start again. Wild Worlds is a bit difficult to explain, if you play the game you will get it very fast. It’s not that difficult at all. I have played the game a little bit today and I am not sure if I love the game or hate the game. I never got a really big win and also did not defeat any boss. But I did get a couple of free spins bonuses and those are a lot of fun. I really feel this new NetEnt slot game is one of those games you love or hate. Check out the promotional video below or play the game at any NetEnt casino.